Peanut butter is filling, rich in protein, and tasty. But is it good for weight loss? It's a dilemma many dieters face. Especially those of us who love peanut butter but still want to shed extra pounds. It doesn't help that there's a ton of conflicting information out there. Some people swear by it and recommend it for people who want to burn fat. But others caution that it will sabotage your diet, so you should stay away. If you're confused, read this. We researched this issue to learn what diet and nutrition experts had to say and summarized our findings below. We put it in a question-and-answer format for your convenience. Without a doubt there are health benefits to eating peanut butter. Almost all types of peanut butter are dense with protein. A typical serving will contain 6-7 grams of protein. Even the brands that are full of extra sugar and partially hydrogenated oils have a significant amount of protein. 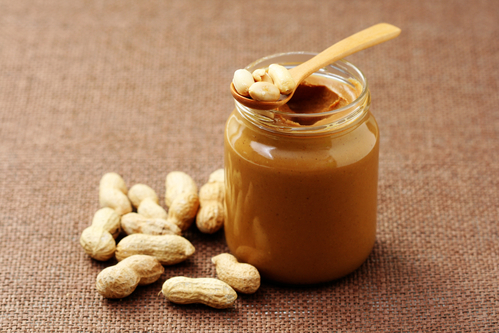 Natural peanut butter tends to have few carbs, making it suitable for low-carb diets. It also is a rich source of oleic acid, a healthy omega-9 fatty acid that can help reduce cholesterol, prevent type 2 diabetes, reduce blood pressure, and promote fat loss (source). Peanut butter is also dense with vitamins and minerals. A typical serving contains a significant amount of your daily value of vitamin E and niacin, and about half of your recommended daily folate intake (source). The short answer is: yes. Despite being calorie dense, peanut butter can help you lose weight. It has a lot of nutritional value in each serving, provides protein to sustain lean muscle growth, and makes you feel full. But you should limit it to small quantities, and only choose natural peanut butter brands. Some of the most popular brands of peanut butter (think: Jiffy) contain added sugar partially hydrogenated oils. The added sugar in these brands will make it harder to lose weight. And partially hydrogenated oils contain trans fat, which raise cholesterol, and increase risk for stroke and heart disease (source). Will Peanut Butter Cause Weight Gain? If you eat too much peanut butter, and/or the wrong kind, then yes, peanut butter will cause you to gain weight. It is popular among bodybuilders and people who are trying to gain weight. That is because it is so high in calories and protein. With peanut butter, moderation is key if you're trying to lose weight. Stick to brands that only contain peanuts (and perhaps salt) as the only ingredients. What Is The Best Peanut Butter If I Want To Lose Weight? Any peanut butter brand that is free of added sugar and partially hydrogenated oils is good for weight loss. With peanut butter, the fewer ingredients the better. The best peanut butter for weight loss will only contain peanuts, and maybe salt. Organic peanuts and high-oleic acid peanuts are nice but not necessary for weight loss. Adams Peanut Butter is a popular brand that's been around for ages. You can buy it creamy, crunchy, or unsalted. There are similar brands out there making it hard to choose one among the rest. But Adams has a rich flavor and only contains peanuts and salt (unless you get the unsalted kind). Does Eating Peanut Butter Before Bed Burn Calories? No, eating peanut butter before does not directly burn calories. But it does help you feel full, preventing night time food cravings. And it's also a good source of tryptophan, an amino acid that induces sleepiness. For dieters who are also trying to build muscle, the protein in peanut butter can help promote muscle growth and reduce muscle wasting throughout the night. In that sense, peanut butter can help you lose weight when you sleep, but it does so indirectly. But moderation is important. Eating too much peanut butter before bed – or any time of day, for that matter – will result in a calorie surplus and could lead to weight gain. If you're trying to lose weight, peanut butter can be a great addition to your diet. It is highly nutritious, and you only need to eat a small amount to feel full. Just don't overdo it. Since it is so dense with calories you can easily end up consuming more calories than you burn in a day and gain weight. And be sure to avoid brands with added sugar and partially hydrogenated oils.